We have had many requests for this wax which is a worldwide favorite of furniture conservators and museums. Renaissance is made of a blend of micro-crystalline "fossil" waxes that is highly resistant to moisture, fingerprints, and heat. 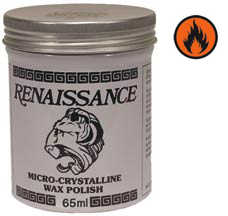 Renaissance Wax is free from acids and solvents, so it will not harm even the most delicate of surfaces. It contains no silicone and can be removed if needed by using mineral spirits. It can be applied to bare wood or on top of a finish in a thin film that dries glass clear and will not yellow over time. A matte finish (unbuffed) or high gloss finish(buffed) can easily be acheived. This wax is great for use on metal tools, leather, marble, paper and instruments. Available in 65ml (2.25oz) or 200ml (7oz. ).